An easy way to do some family coastal cycling with plenty of beach stops and mobile home options. 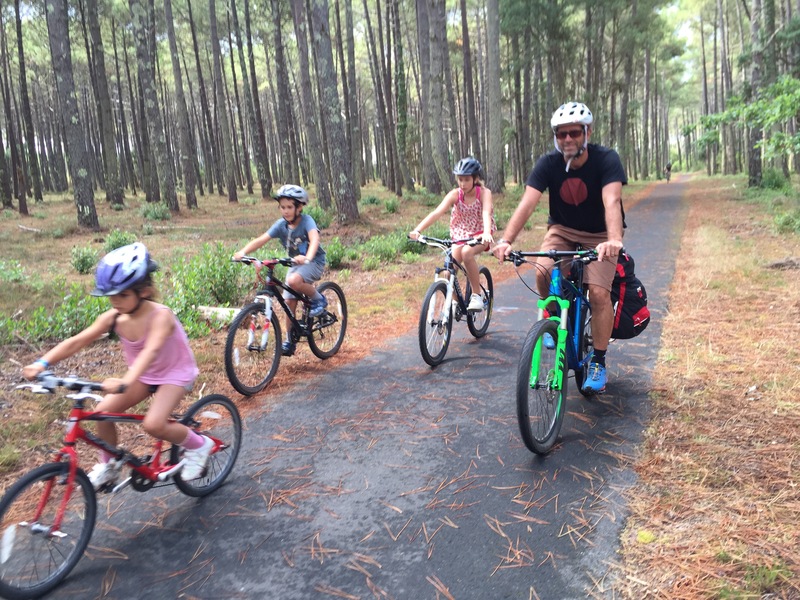 We loved: Everything about this route-to-route medium sized relaxed pace bike ride from Biarritz to Contis-Plage, and the pine forest / laid-back beach combo — would definitely like to return and try the next stage. Downsides: Getting your head around the packing, and it seems that some sections of this route are easier than others. One of the sights most guaranteed to turn my head is a bicycle laden with panniers. (Another is a camping pitch with its own bathroom cabin, but that’s for another time). I still remember years ago wistfully watching a family cycle along a local canal path with a trailer for their stuff, a tag-along for one child and another child cycling independently. One day, I decided, that’s going to be us. Every year we inch slightly closer to the dream, and this year we were determined to have a go at a longish distance (or even medum-sized) route-to-route bike ride. The Cote d’Argent sounded like a good bet. Miles of off-road cycling along the coast among pine trees with plenty of campsites along the way? Bring it on, we said. The plan was to find 3 sensibly spaced mobile homes on sites with pool complexes with 2 night availability so that we could cycle as a family on alternate days and Garry or I could deliver the van to the next stop on the days in between while the children swam. The pools were crucial as we would usually avoid the larger sites but thought they might be a helpful trade-off for the cycling days. Hours of time on the Eurocamp website (and a few minutes on the phone —lesson learned) and our plan was in place. 1. Although there is a very lovely and useful Velodyssey website, the actual maps aren’t downloadable and it was only when Garry visited a proper tourist office the day before we were due to set off and bought a map pack that we realised that a) the beginning of the route was quite a complicated stage away from our first campsite and b) our planned day 2 was quite a lot longer than we’d expected. What this meant was that our first day, from Biarritz to Labenne, turned into half drive (to Tarnos Plage) half cycle (Tarnos Plage to Labenne) — so our anticipated 20k was actually a short 10k. While this was great for the kids, and especially Isaac, who found the relentless motion of cycling hardest (Orla is still being towed by Garry) it was, to be honest, a bit of an anticlimax for us. The signposts didn’t fail us once and the routes were well marked. UK road planners take note! This is how it is done. 2. The combo of mobile homes / panniers / alternately having the van and then not having it made my head literally explode with the effort of working out what we needed for each bit. Imagine the packing! Every other day a pannier or two with just the essentials, in between those days a van full of stuff but parents not keen on continually removing and repacking all that stuff. In the end we settled on travelling really light for the whole thing, which was actually invigorating, but it took a LOT of thinking about the day before we started. Niggles aside, the first two days were pretty successful. After all the logistical head-scratching and some packing flim-flammery we enjoyed the cycling, the friendly communal cul-de-sac-in-Britain-in-the-70s feel of the campsites and the fancy swimming pool complexes. The maps and the routes were family-friendly, there were plenty of beach /cafe/ ice-cream stops on the way and the terrain was flat, shady and wonderfully pine-scented. We started in chic Biarritz for coffee and a stroll along the prom. In one of those lovely moments of tourist serendipity, we happened upon the 10KM coastal run, La Foulee du Festayre, which marks the start of the 2 week Fetes de Bayonne. I think this has to be the coolest run ever: everyone dresses in the red and white festival colours so the whole run is a thing of beauty, and the vibe is relaxed and friendly. Wow. Mobile homes have come a LONG way since I last stayed in one! Sylvamar camping turned up trumps for our second campsite. We loved arriving by bike, our mobile home was as swish as they come, and the pool with lazy river kept everyone busy, as did cycling around the gorgeous spacious site and playing a spot of badminton or Pit with newfound friends. The second cycling stage felt very different from the first — more towns to negotiate (mainly Cap Breton and its marina but also Segnoisse), more varied terrain, more cycling alongside roads and less shady paths. I did still marvel at the amazingly connected network of voies vertes though, which didn’t fail us once, and cyclists definitely rule in this neck of the woods. The kids found this day tough and we were basically cycling all day with plenty of beach / snack stops. What took Garry 1.5 hours to cycle on his own took us around 7 hours! Plenty of cycling distractions and entertainment required: We did points for pedestrians and bikes we overtook, took it in turns to name the dogs we saw and, finally, for Isaac, embarked on a very long discussion about Pokemon and Percy Jackson until finally Sunny the van was in sight ready for our short hop to the campsite. Hurrah! Read, walk, or both? Campsite chilling. The last section of our Velodyssey, from Lit-et-Mixe to Contis Plage, was by far the loveliest. The kids were in the groove, it wasn’t very far and, because there weren’t any towns to negotiate, it was pine forests and sand dunes all the way. Orla is finally free! She cycled a fair bit of this section. As coasts go, this part of France is jaw-dropping. Endless sandy swathes bordered by pine forests, plus miles of traffic-free velo routes and good places to eat makes for a really easy summer holiday. Even on our small section of the route we loved the variety of landscapes and the laid-back attitude. And the trees! They go on … and on … and on …..
An hour up the coast from Contis is a monster of a sand-dune. It is the largest in Europe and is apparently so large it even swallowed up a town at some point in its inexorable rise to Guinness Book of Records fame. Such a thing just had to be visited! Before we went, I was prepared for disappointment — after all, how big could even the largest dune in Europe actually be? — but it was well worth the trip. Clearly half the people in France also think so, because there’s an entire street of tourist tat shops the like of which I’ve only ever seen in Pisa or Knosssos, and a steady line of holidaymakers schlepping up the 150 steps somebody digs out at the start of every season to the summit. It was lovely to visit in the evening because the light was long and lingering, with endless sea views on one side and vast pine forests on the other. After days of cycling through the dense Landes forest it was a big relief to get up high and get a sense of perspective from above. Parascenders were bouncing around and we contented ourselves with enjoying the fine warm sand between our toes, taking a million photos and running down till our legs almost fell off! We used the amazing http://www.velodyssey.com and their printable maps (available at the tourist offices) to plan our route. X is for Home eXchange!